Sometime in the murky depths of March, after we were told that we need to raise funds for a new sink in the workshop, Mike and I decided that an appropriately gruelling and nearly impossible challenge was needed. 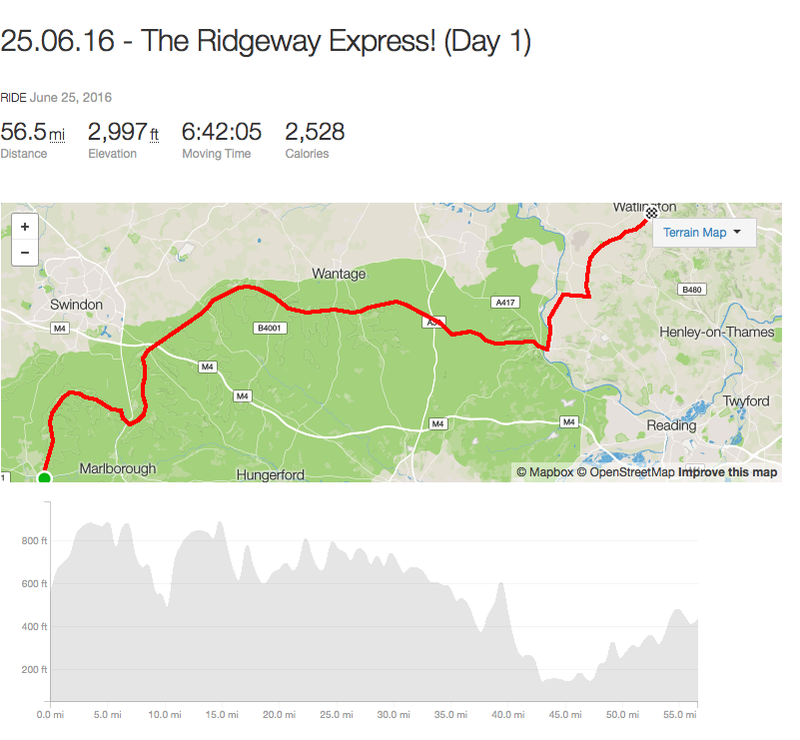 It would be an end-to-end ride on the Ridgeway. Little did we know just how right we would be. Summer was just around the corner so we decided that it would be appropriate to split the ride into two days and spend one night wildcamping. We would carry an extra load, yet we felt confident that the challenge could be completed. Other Broken Spoke volunteers were interested in joining the ride but because of conflicting schedules only Jarno was able to make it. The date was set as the weekend of the Glastonbury festival. It’s always hot and sunny on a Glastonbury weekend, right? After an evening of burritos, pints, darts and numerous OS maps on small pub tables a plan was set. 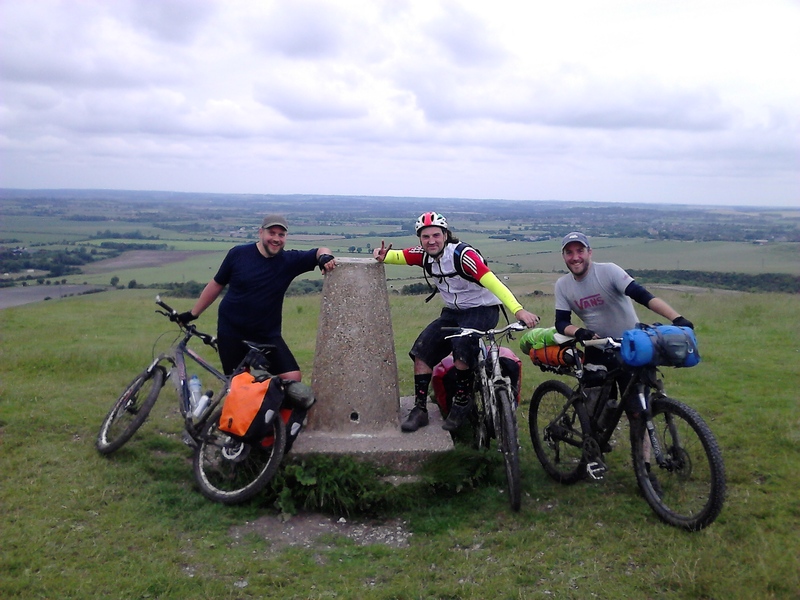 We were getting a lift to Overton Hill and using the prevailing westerlies to ride all the way to the Ivinghoe Beacon. We’d use our mountain bikes and fit them with racks for the food, tents and sleeping bags. Everything was set and ready, until Jarno’s bike decided to give it up on a ride in Wales a few weeks before the big ride. This meant that he was going to use his newly build cyclo-cross bike, which could be easily adapted for more demanding riding with extra luggage. Mike’s wife kindly agreed to sacrifice her Saturday morning for us and after a 7 o’clock start from Oxford, Mike and I were waiting for Jarno at Overton Hill. To our surprise, when he arrived he pulled out an old hybrid with slick tyres from his car. Apparently the new tyres for the cycle-cross were too wide and this was the only bike he could find as a substitute. Well, at least it had a pannier rack and the CX tyres fitted it fine, so soon after we set off on our ride. The Ridgeway is an old road, used for millennia by the locals and it was set on top of hills and ridges in order to avoid rivers, bogs and marshes. This meant a good amount of hill climbing and we didn’t mind this, since the climbs were followed by breathtaking views and headlong descents. Soon after we started, we noticed the big rainy clouds chasing us from the west. Our ride turned into a game of timing the arrival of the rain with finding a big leafy tree to hide under until it blew over us. On a few occasions the timing didn’t quite work out and we were drenched. This of course made us ride a little bit faster so we could dry out in the sunshine which followed. Soon we crossed the M4 and found ourselves in Oxfordshire. Just before the White Horse Hill, the track changed to rutted clay, which combined with the rain made the surface nearly impossible to cycle on our overloaded bicycles. The descents now resembled a bobsled ride – fast and seemingly out of control. At this point Jarno announced that the best way to go downhill is not to use any brakes and demonstrated exactly how it’s done. Wantage and Diamond particle accelerator passed on our left and the surface slowly changed to mud and wet grass. We could hear the roar of the A34, which meant we’d be crossing to West Berkshire soon. 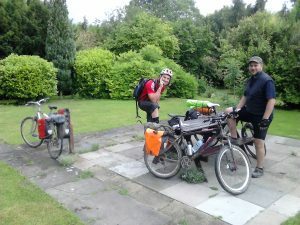 After a few more rain showers and steep climbs, we finally found ourselves on the mile long descent towards the Thames. This made us feel cheerful as it seemed that the ride from now on would be mostly flat. We crossed the river and stopped at John Barleycorn in Goering for a pint. We were aiming for Watlington and had lots of time to get there. It was a short stop to repair Mike’s puncture and some more hiding from the rain. We were covered in mud and needed a good meal before the end of the day, so our decision to stay at a campsite was welcomed by everyone. 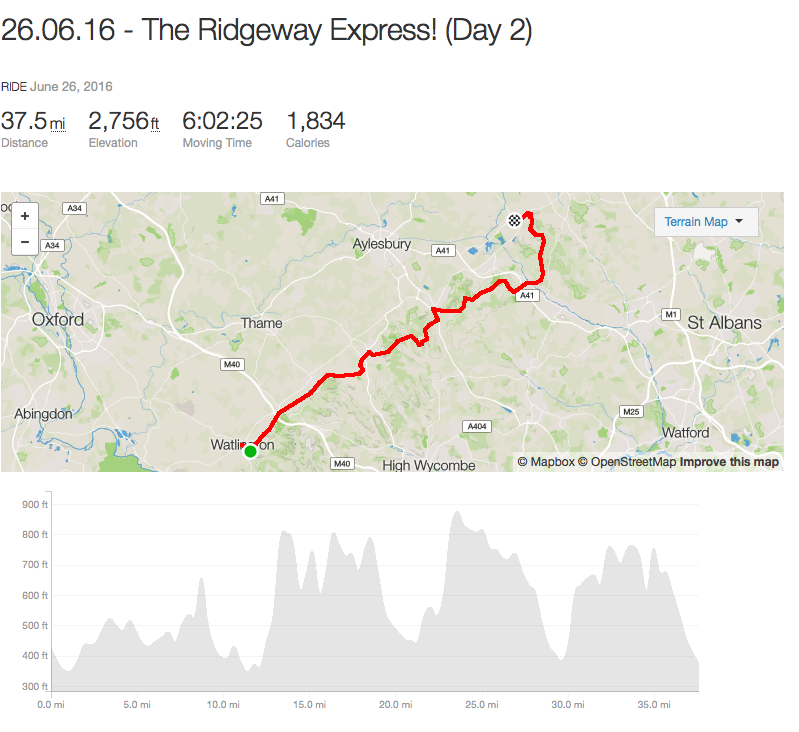 The Chilterns didn’t deliver the flatness we expected and I was really starting to struggle on the uphills. Getting to the campsite felt like a major achievement. We set our tents and walked to Watlington for a fish and chips dinner in the open air restaurant called “The bench”. Back at the campsite, the temperamental warm showers and the relative dryness of the place made us feel glad. After the 56-odd miles of riding we were feeling exhausted. A 7.30am start and breakfast f rom the local Co-op and we were on a mission to find a coffee shop. We only had 35 miles to go, which seemed minuscule compared to head-spinning 56 from the day before. 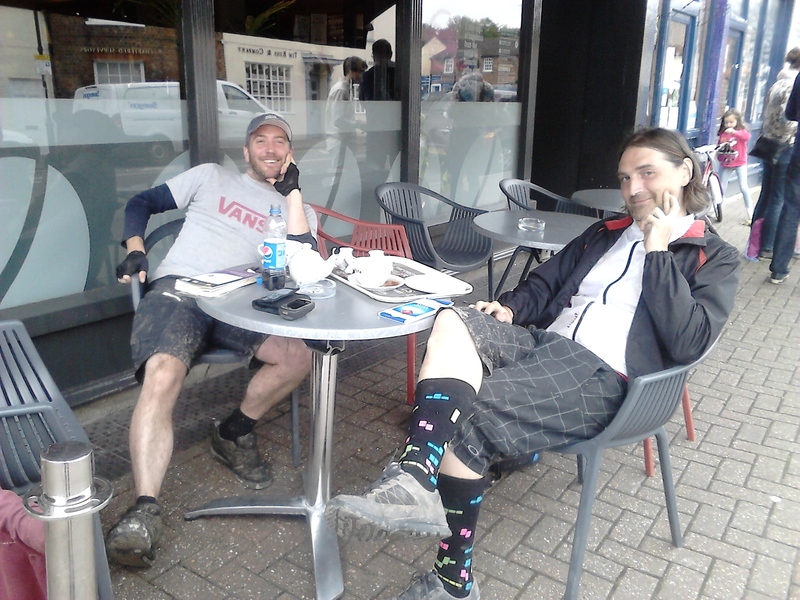 The ride to Chinnor reinforced the easy feeling and soon we found the Costa in Princes Risborough. We were planning an early finish and a possible 30-something mile ride back to Oxford. 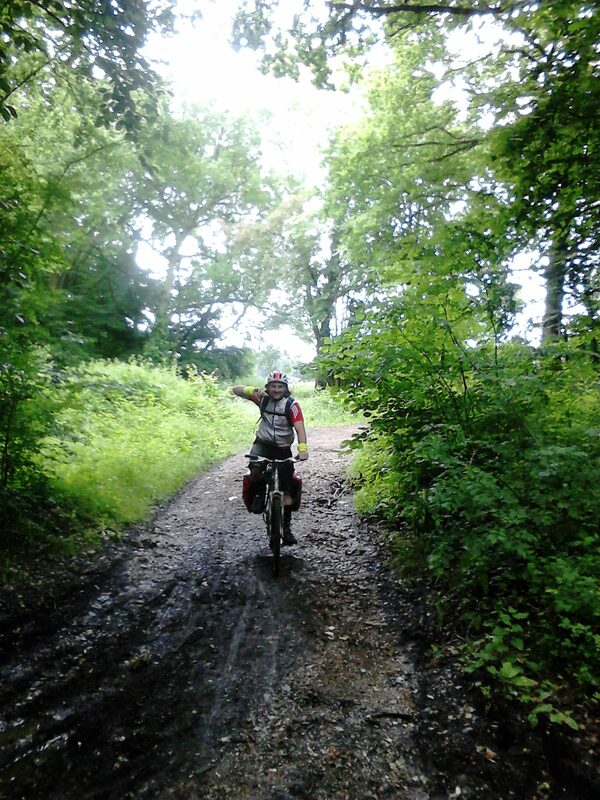 Mike did warn us that soon it will get hilly and very tricky to follow the route, but the dry weather and most welcome caffeine rush made us feel optimistic about the rest of the ride. The hills around Wendover are nothing to joke about. Our bikes, loaded with extra weight were not quite suited for the challenge. A few club riders with skinny bikes waiting for each other at the top of one of the climbs were ignoring our overloaded and mud covered machines. We didn’t have time to wait and were pressing on. The previous night’s rain made the tracks a mixture of mud, leaves and flint with muddy puddles deep enough to submerge our wheels up to the hubs. Mike skilfully repaired another puncture under the sights of the local dog walkers. After hours of strenuous uphill and treacherous descents, we were reduced to pushing our bikes up on tracks that resembled the initial part of a rollercoaster ride, where the train is pulled nearly vertically up to the highest point of the track. Soon Tring was in sight and the ride got a bit easier. One more climb and we were only 2-3 miles away from our destination. We felt more lost than at any point of our journey. After giving up on the GPS’s directions we eventually found ourselves at the end of our ride – Beacon Hill near Ivinghoe. Ecstatic and exhausted we cracked open a beer and spilled some whiskey. It was getting late and we had to figure out a way of getting back to Oxford before the rain started. What a great route and how much fun was it to ride it together. Was it worth it? Hopefully. Will we do it again? For the next fundraiser – of course! Environmentally friendly bike parts washer anyone?